"Norm, just received the pen today in the mail. What a outstanding looking pen, especially with the large black nib. You are right it bends toward the EXF. It writes beautifully and is well balanced. I usually never post my pens. Now going back on my history studies, the pen is very Moorish in appearance. 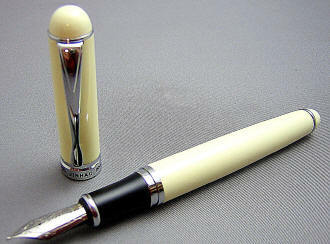 The ivory, lack of gold coloring and the black grip section and nib all add to the Moorish sociology of its appearance. I am going to make a pen rest for it out of gaboon ebony from Africa. The wood is solid black an hard as iron. I will make that in a Moorish design. Anyway Norm, a really nice pen. Thank you very much." 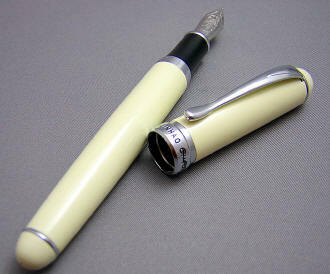 "Dear Norman, I've been meaning to write and thank you for the service you provide the fountain pen community. I love this Jinhao Ivory. It is wonderfully comfortable to write with, writes beautifully and is completely reliable. Thanks again." 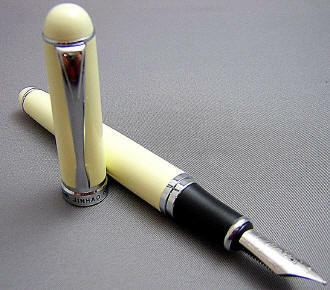 and honestly, writing with the Ivory is as enjoyable to write with, if not more so, than some of my more expensive pens. I'm so glad I found your website." No elephants were harmed in the making of this pen! 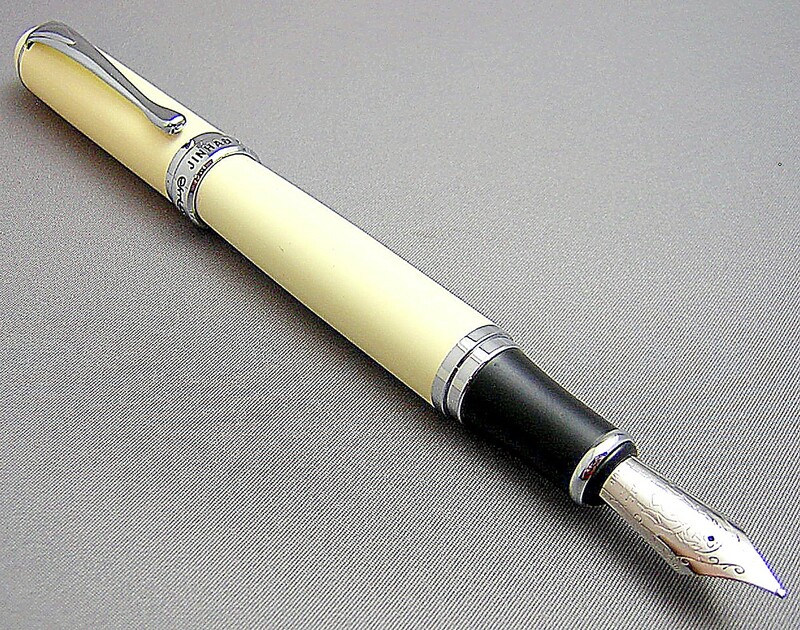 I've always liked ivory-colored fountain pens, and this is a beauty. This is a full-sized pen as these things are currently adjudged, measuring 5-1/2" capped, 6-1/4" posted and 5" with cap held aside...with an oversized nib. The silver bands and clip don't interfere with the coloration, and let the ivory speak for itself. 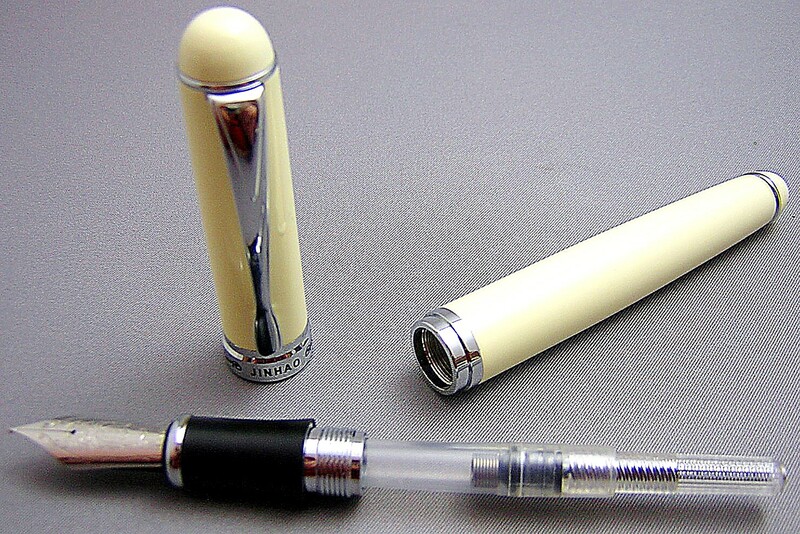 Removing the slip cap -- which securely reattaches with a satisfying snap -- reveals the oversized nib (larger than that on a Pelikan M800 for instance, but not quite as large as that one a Montblanc 149), as well as the cleverly-designed section, with grooved finger pads for a secure grip. The nib is a two-toned, 18K gold-plated steel nib. I personally find these nibs a joy to use, and rate them as western mediums. 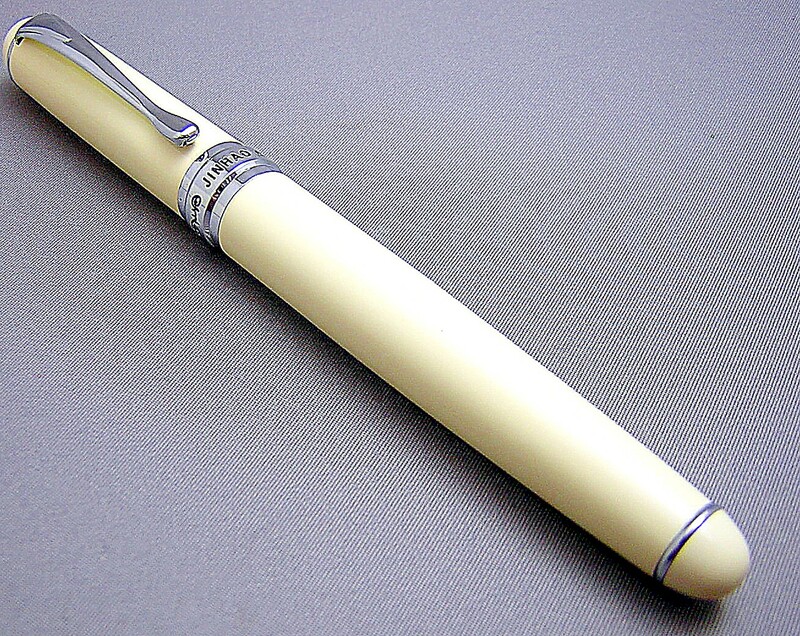 This is the same underlying pen model as the Desert Sands, Plasma, Snakeskin, Starry Night and White Spatter.